Last February, Field Trip Boy and I drove to Las Vegas for the weekend to take in the sites and enjoy some quality time together. 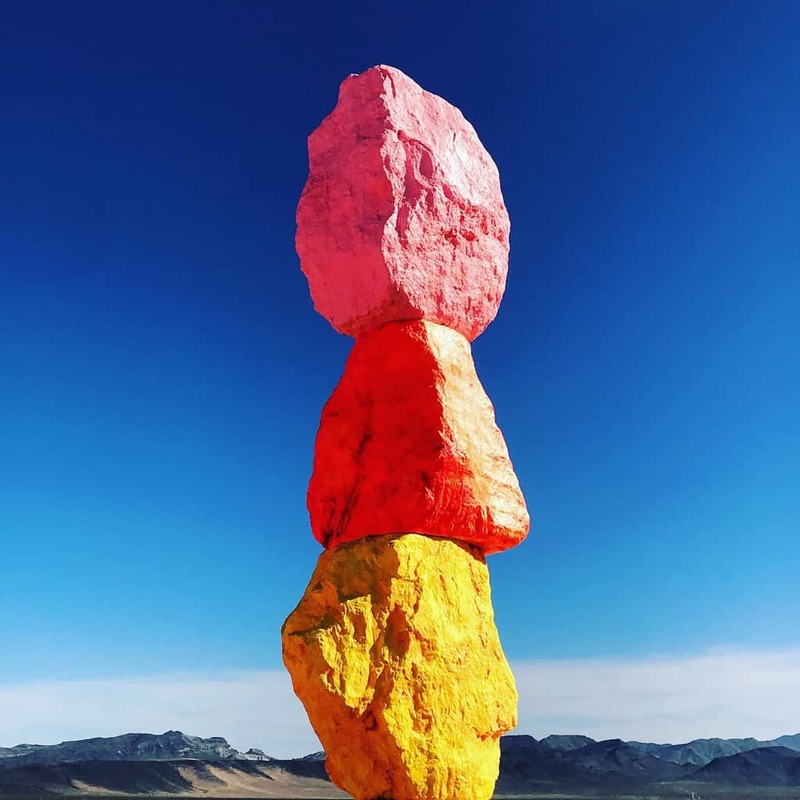 On our way out to the desert, we stopped by the Nevada public art exhibit by internationally-renowned Swiss artist Ugo Rondinone called Seven Magic Mountains. 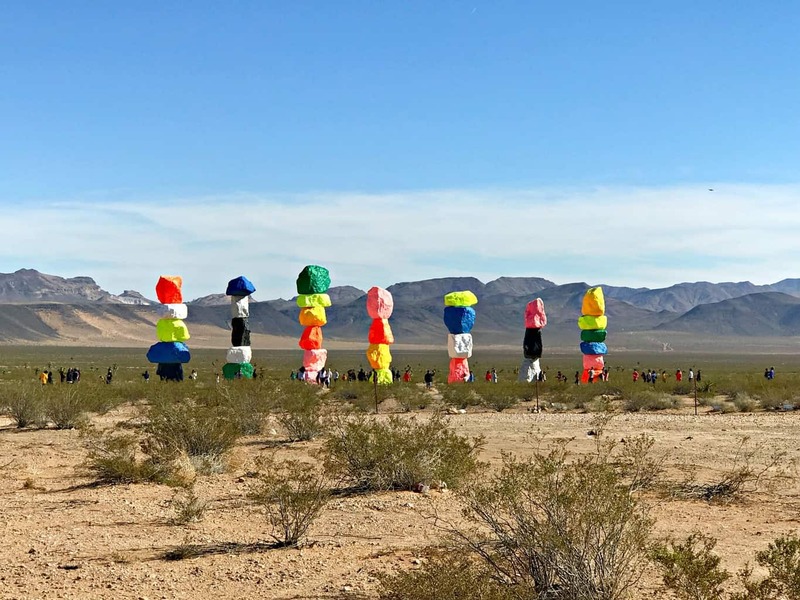 Prior to our visit, I had seen several pictures of the colorful art installation on social media and heard from many of my travel friends that the exhibit was inspiring to see from the freeway. However, getting up close and personal was even better. As my son and I discovered, they were right! Seven Magic Mountains is a large-scale public art installation located near Jean Dry Lake and Interstate 15, approximately ten miles south of Las Vegas, Nevada. 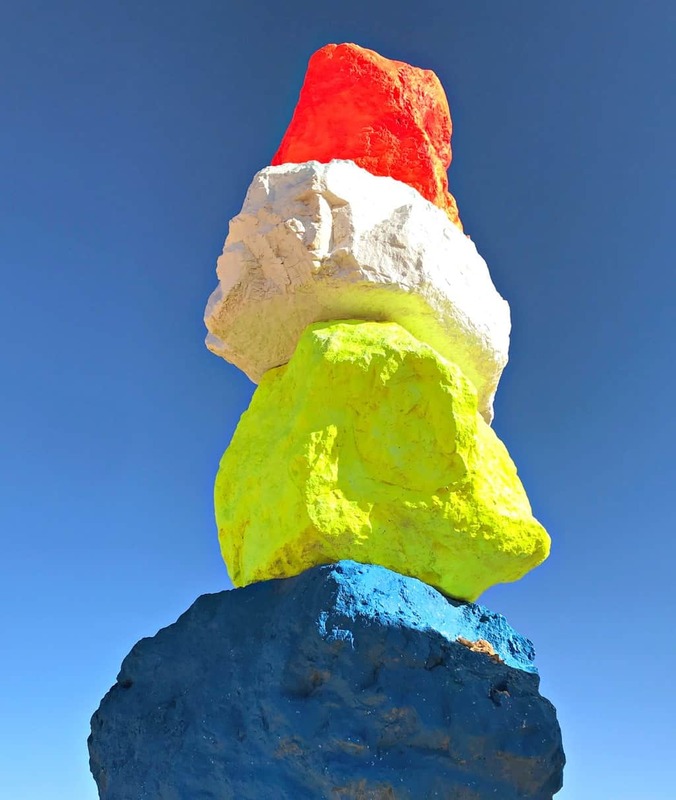 Comprised of seven towers of colorful, stacked boulders standing more than thirty two feet high, Seven Magic Mountains punctuates the Mojave desert with a poetic stream of light and color. 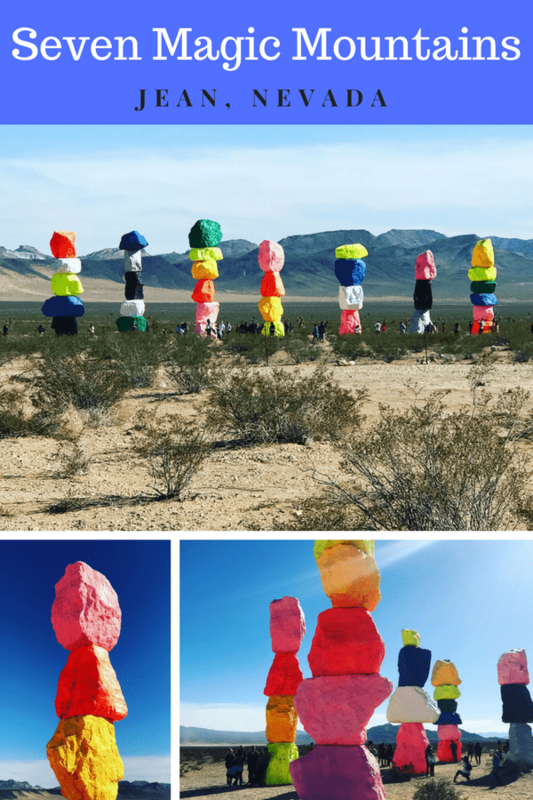 Seven Magic Mountains is the brain child of Ugo Rondinone, a New York-based, Swiss-born mixed-media artist noted for a range of contemporary paintings and sculptures. His work has become recognized for its ability to channel both psychological expressiveness and profound insight in the human condition and the relationship between human being and nature. Rondinone recent solo shows include Carre d’Art, Nimes, Boijmans van Beuningen, Rotterdam (2016); Palais de Tokyo, Paris, Secession, Vienna (2015), Rockbund Art Museum, Shanghai, Museo Anahuacalli, Mexico (2014); Art Institute of Chicago, Chicago, M Museum, Leuven (2013). 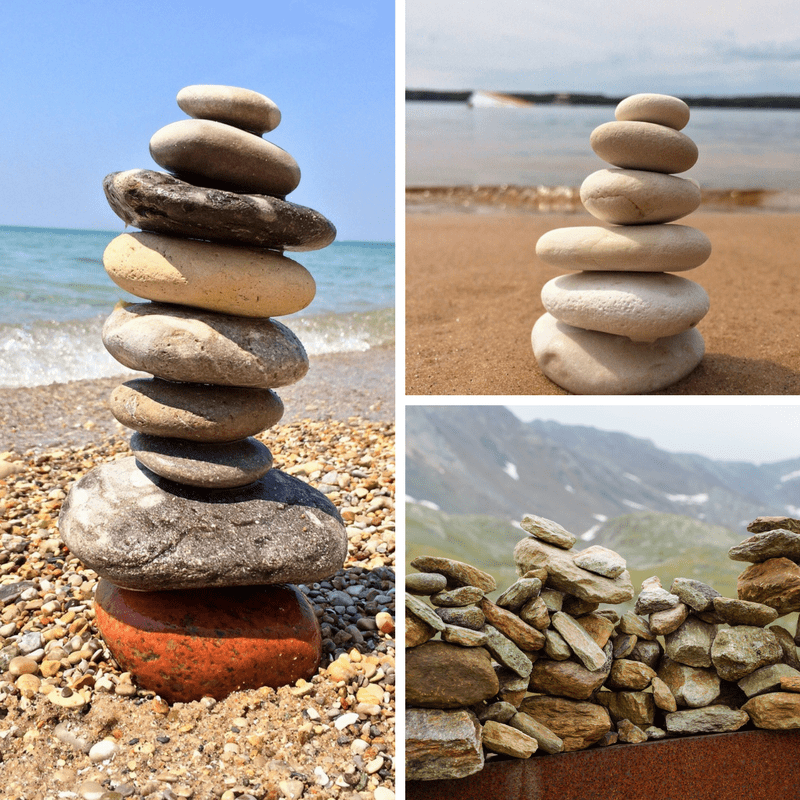 Stone balancing is an art, discipline, or hobby in which rocks are naturally balanced on top of one another in various positions without the use of any adhesives, wires or contraptions to help keep the rocks in place. Stone balancing is also described as a problem solving skill. Centuries ago indigenous peoples in the United States often used cairns to help them cover and bury their dead. Today, my children enjoy stacking rocks on top of one another and balancing them carefully as we go on hikes in the wilderness or visit local tide pools. The contemporary art installation by Ugo Rondinone reminds me of these family adventures. 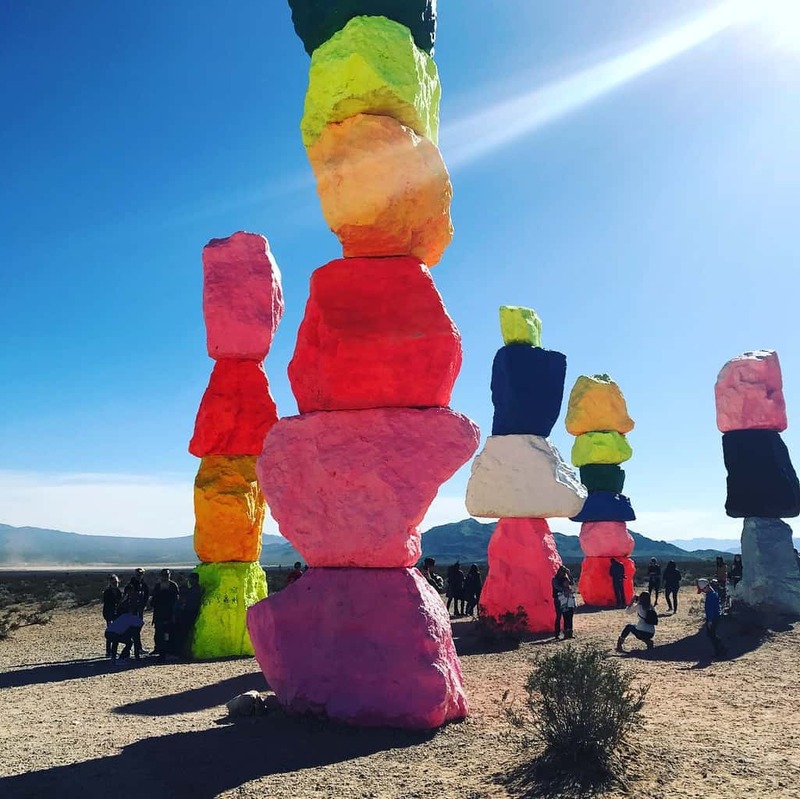 As one of the largest land-based art installations in the United States, Seven Magic Mountains is bringing happiness to the desert. 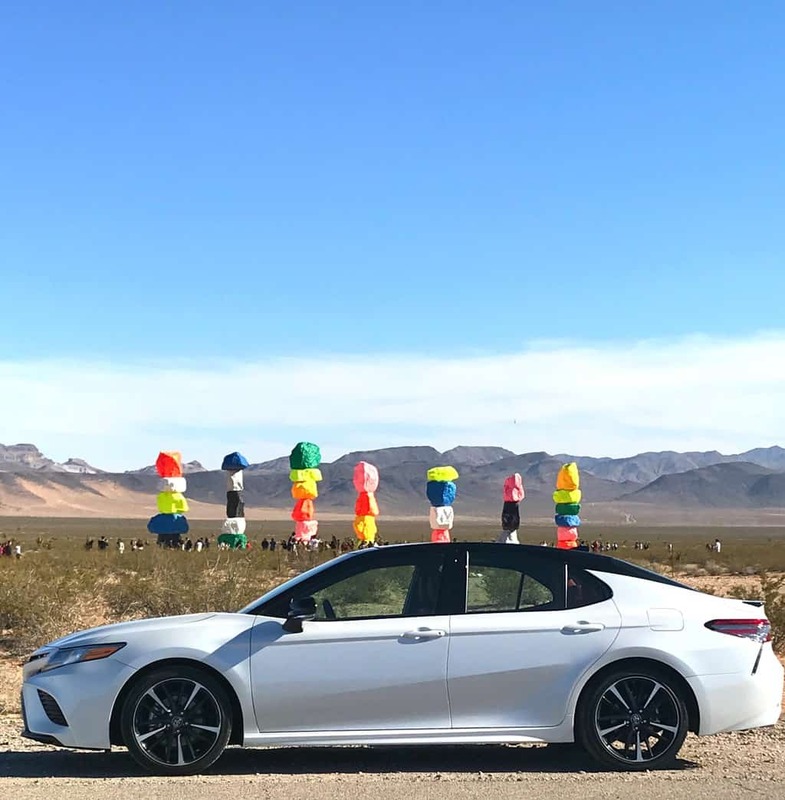 Positioned within the Ivanpah Valley and surrounded by the local mountains, Seven Magic Mountains stands out as eye candy along the freeway. Each locally-sourced limestone boulder boasts a different fluorescent color ranging from neon pink to a deep ocean blue. Visitors can’t help, but stop and take a photo. The colorful rocks beckon you to leave your car, walk down the short dirt trail and look up at the giant boulders. 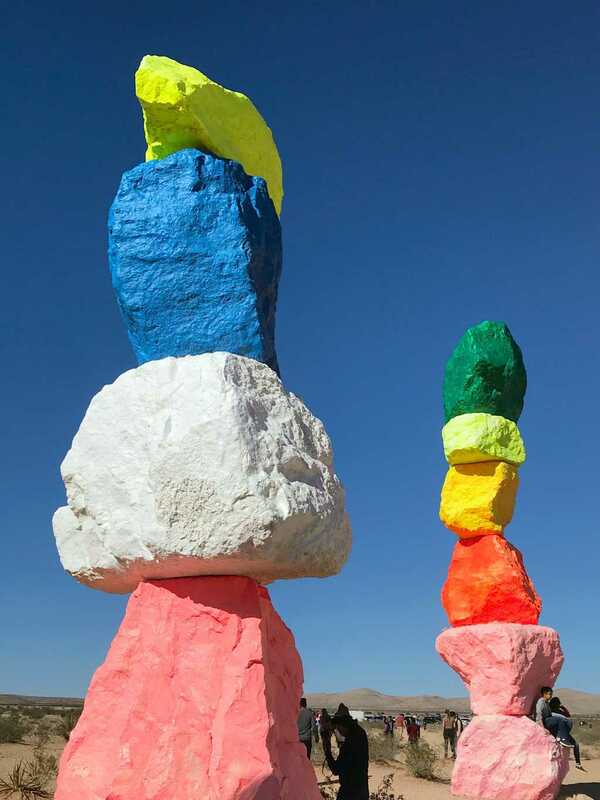 The Nevada Museum of Art and Art Production Fund are developing education and interpretation materials for schools, on-site smartphone tours, lectures, and other public programs for the community that will place Seven Magic Mountains within the larger context of artworks created on public lands in the Western United States. 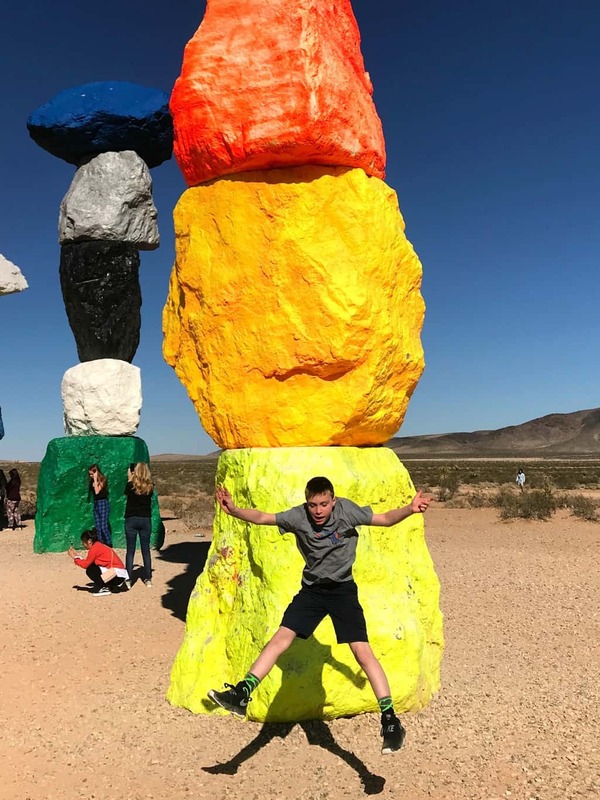 K-12 teacher who are want to infuse art education into their classrooms can apply themes present in Seven Magic Mountains to various disciplines including common science core standards. Downloadable lesson plans and curriculum addendums are available at www.sevenmagicmountains.com/learn. Parents can also use these teaching tools to create an educational family experience while in Vegas. Watch out for venomous snakes, as signs warn visitors on the trail. Wear good walking or hiking shoes on the trail. There’s a self-guided cell phone tour available. Simply call the phone number and follow along as you get an in-depth tour of the totems. Leave no trash or human waste behind. Bring bottled water with you as there are no stores within a 10-mile radius of the exhibit. Type in “Seven Magic Mountains” on your cell phone or GPS system for good directions. Watch out for tumble weeds on the road. Dress in layers. You never know what the weather may be like. Bring a camera or smart phone to take photos. Some people like to bring additional photo props like balloons to add dimension to their pictures. Seven Magic Mountains was originally scheduled to be on view for only a few years. 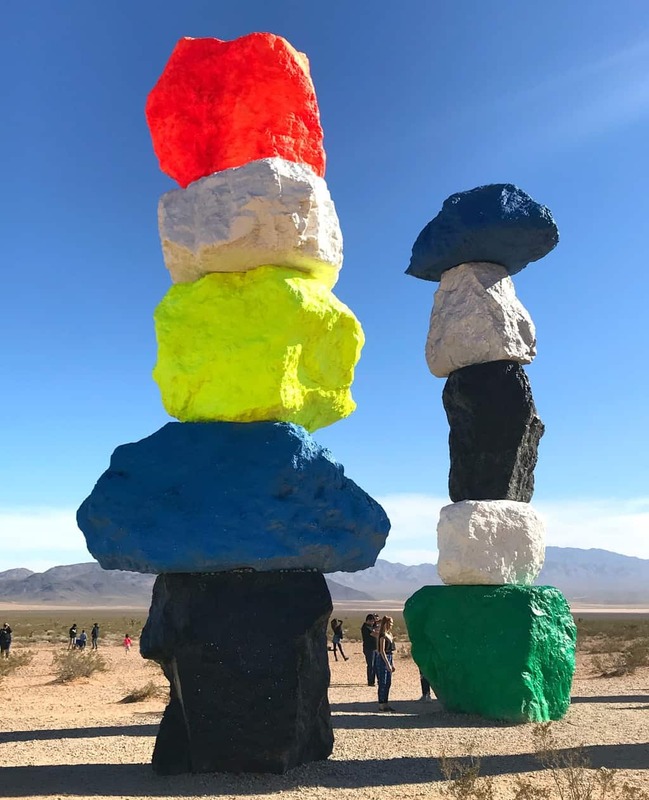 However, due to the incredible success of Seven Magic Mountains, artist Ugo Rondinone has expressed a strong desire to explore ways to keep the artwork on view at its current site. 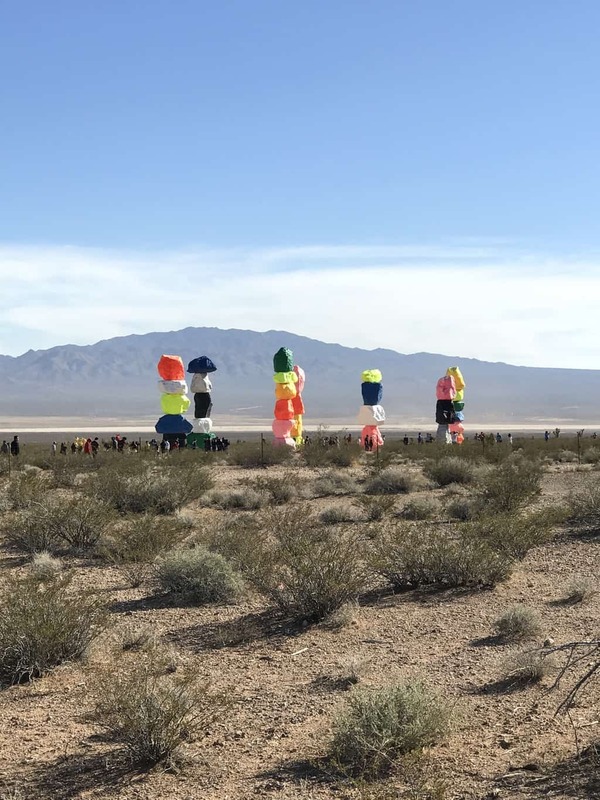 So, at the end of 2018, the Bureau of Land Management issued a three-year permit extension for the artwork, allowing the installation to remain on view through the end of 2021. 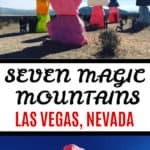 To learn more about Seven Magic Mountains and get ideas on how to plan your trip to see these beautiful boulders in the Nevada desert, visit http://sevenmagicmountains.com.